This bill was initially placed before the Senate in 2008 without any actions takes until the CPFA-P became aware in 2013 of the Chiropractic Act pending so many years. This prompted a senate committee hearing Tuesday, August 5, 2014 (comments below) and we are happy to say that the Senate hearing was a small success! When the government changed again the bill was reintroduced in 2016 it sadly remained unchanged, following earlier discussions requesting to place the responsibility of oversight under PITAHC and not the PRC for good but various reasons. In October 2016 a follow up committee hearing on the new bill 629 was held with the attendance of several new stakeholders from the medical profession. The outcome as stated by the Senator was: “We hear your views and yet, the chiropractors are here and they need to be regulated.” (end of story) An invitation was made to have additional inputs from all represented parties come to a consensus so the bill can move forward. Sadly, over one year has passed and no meetings have been held to advance the bill. Paciente! Everyone came together united and showed support on the said Bill. 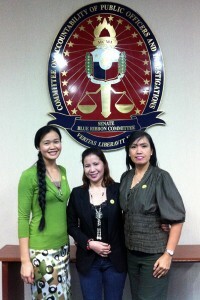 Each organization had representatives that were able to express to Sen. Trillanes and the audience its desire to regulate this Act, so as to protect the public from unscrupulous misrepresentation of the profession, provide easier access to its health benefits, and put up chiropractic education in the Philippines. parties. The Senator expressed that if a “peaceful hearing” like this would go on, the Chiropractic Act Bill 993 would be able to move forward quicker. Thanks to Senator Trillanes and his staff, to the Chiropractic orgaizations, and to all of you supporters — chiropractic in the Philippines is now having major progress in its profession and service to both Filipinos and foreigners in the country.